To help healthcare professionals, medical researchers and the public understand the ongoing opioid epidemic, Elsevier, the information analytics business specializing in science and health, has created the Opioid Epidemic Resource Center. The Opioid Epidemic Resource Center, freely available on Elsevier Connect, Elsevier’s public news and information website, includes content from Elsevier’s many medical journals, textbooks and other clinical resources. Also available is information that is used by practicing nurses and doctors and resources for patients and their families. “With our new Opioid Epidemic Resource Center, we strive to bring together the best available evidence on the opioid epidemic to assist healthcare workers, researchers and policy makers understand the effects of the crisis and demonstrate the wide scope of information Elsevier has available,” said Leslie Dye, MD, Editor-in-Chief of Point of Care Content for Clinical Solutions at Elsevier. Dr. Dye, a medical toxicologist and emergency medicine physician, is curating the content featured on the resource center. The United States federal government recently declared the opioid crisis a public health emergency. That declaration will redirect federal resources and loosen regulations to combat opioid abuse, particularly in rural areas. More than 100 Americans die daily from related overdoses, according to the Centers for Disease Control and Prevention (CDC). Opioids, primarily prescription painkillers, heroin and fentanyl, are fueling drug overdoses across the USA. 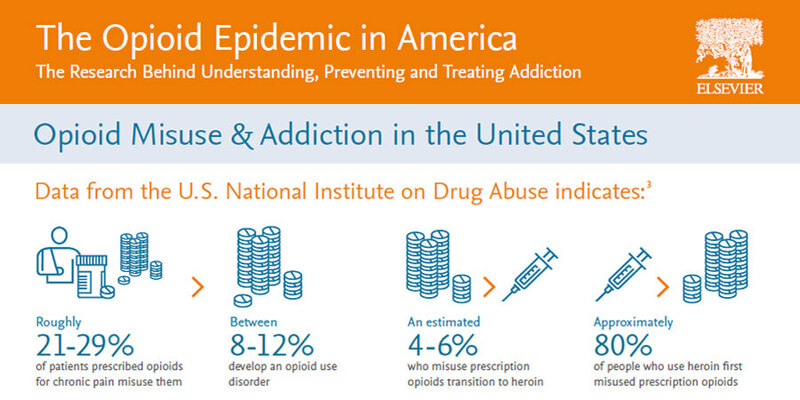 Infographic presents overview of opioid misuse and addiction in the USA. Credit: Elsevier’s Research Intelligence Campaign, The Opioid Epidemic in America and US National Institute on Drug Abuse. “Decisions affecting the public’s health should be supported by the best available evidence, and our resource center will aim to keep these audiences updated with the latest research and analysis as responses to the crisis unfold,” said Dr. Dye, who also practices addiction medicine at Northland Intervention Center in Milford, Ohio. The Opioid Epidemic Resource Center is advised by Dr. Dye and other professionals at Elsevier and will be updated with the most current research and evidence-based information available. Elsevier publishes about 25 percent of the world’s scientific content, including thousands of textbooks and journals, drug information, clinical guidelines and patient education. The resource center on Elsevier Connect also links to other authoritative resources, including the CDC and the World Health Organization (WHO). In addition, the site features links to data from Scopus and SciVal, which provide insight into global research on opioid use and abuse.